Formula Three, also called Formula 3 or, in abbreviated form, F3, is a type of formula racing and a class of auto racing. It is widely accepted as an important step for drivers towards Formula One. While a few drivers have gone on to drive in open-wheeled motorsports premier category since the inception of Formula Three without driving one, the majority have spent time in the cockpit of these cheap, fast, entry-level race cars. The history of Formula Three traces back to postwar auto racing, with lightweight tube-frame chassis being powered by 500cc motorcycle powerplants (notably from Norton. The 500cc formula originally evolved from low-cost 'special' racing organised by enthusiasts in Bristol just before the Second World War – British racing after the War picked up slowly and home-built 500cc motorbike-engined cars were affordable. Although the formula was originally seen as one for the special-bulder, Cooper Car Company came to dominate with mass-produced cars; other notable marques included Kieft and Emeryson. Formula Three was in abeyance from the late 1950s to 1963; both it and (eventually) Formula Two were replaced by Formula Junior for 1000 or 1100cc cars (on a sliding scale of weights). A one-litre Formula Three for four-cylinder cars with tuned production engines was reintroduced in 1964 and ran to 1970. These engines (the Cosworth tuned Ford Anglia being by far the most popular) tended to rev very highly and were popularly known as 'screamers'; F3 races tended to involve large packs of slipstreaming cars. The "screamer" years were dominated by Brabham and Lotus, with March beginning in 1970. For 1971 new regulations allowing 1600cc engines with a restricted air intake were introduced. The 1971-73 seasons were contested with these 1600cc cars and aerodynamics started to become important. Two-litre rules were introduced for 1974, still with restricted air intakes. As of today engine regulations remains unchanged in F3, a noticeable case of stability in auto racing. As the likes of Lotus and Brabham faded from F3 to concentrate on Formula One, F3 constructors of the 1970s included Alpine, Lola, March, Modus, GRD, Ralt and Ensign. Historically, March (up to 1981), Ralt (up to the early 1990s) and Reynard (1985-1992) had been the main chassis manufacturers in two-litre F3, with Martini fairly strong in France; Dallara, after an unsuccessful Formula One project, focussed their attention on the formula in the early nineties and almost obliterated all other marques. By the start of the 1980's however, Formula Three had evolved well beyond those beginnings to something closely resembling the modern formula. Ground effect chassis were briefly used in the early 1980s but were banned, in line with other FIA single-seater formulae. Formula Three cars are monocoque chassis, using slick racing tyres and wings. Currently, Dallara manufactures the overwhelming majority of Formula Three cars seen on track, though Lola (with partners Dome of Japan) and SLC also have limited production of their own cars. In many smaller or amateur F3 racing series older cars are frequently seen. Usually these series are divided into two or more classes of racing, to allow more cars to participate in the event. Engines in Formula 3 are all two-litre, 4-cylinder naturally-aspirated engines. Engines must be built from a production model block, and often must be sealed by race or series organizers, so that no private tuning can be carried out. Honda engines (tuned by Mugen) have perennially been popular, as have engines produced by Volkswagen, Alfa Romeo, or Renault. Currently Mugen, Toms-Toyota, Spiess-Opel, and Mercedes are the most popular engines. There has never been a World Championship for Formula Three. In the 1970s and into the 1980s the European Formula Three Championship was the most important series. 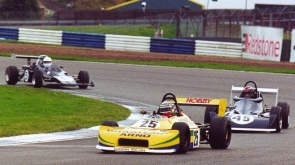 With the demise of that series, national championships took prominence, with the British Formula Three Championship gaining special prominence with a number of future Formula One champions, coming from this series. France, Germany, and Italy also had important Formula Three series. Brazil's SudAm Formula Three championship, wich now has the most powerfull engine of all F3s, built by the Argentinian Oreste Berta, was known for producing excellent drivers who polished their skills in the British Formula Three championship. Perhaps the most curious of all was the small Japanese Formula Three championship. Although few drivers spent a significant amount of time there, future stars such as Michael and Ralf Schumacher and Jacques Villeneuve claimed victories there. For 2003, the French and German F3 series merged to recreate the F3 Euroseries. The most recent Formula One racer to come out through Formula Three ranks is Narain Karthikeyan, the first ever Indian to take part in a Formula One race.